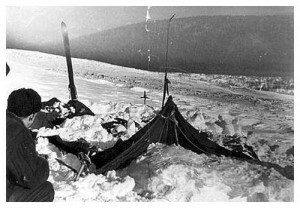 Few mysteries of the modern age can compare to that of the Dyatlov Pass Event. Fortunately for the Davids, that’s exactly how they like it. In this episode of Blurry Photos, they examine the spooky, surreal story of a group of Russian skiers and what happened one night in 1959. The events that took place are so perplexing that it remains unsolved to this day, though that hasn’t stopped the public sensationalism from churning up theories. Flora and Stecco discuss the story and a list of possible explanations for what might have happened on a snowy slope in the Ural Mountains that has come to be known as Dyatlov Pass. Grab a blanket and kiss the dog, ’cause this episode of the podcast is gonna be chilling!